Process your weekly and monthly payrolls using this specialist contractor payroll management system, in the way that suits your business. Full integration with Sage Payroll. Trimble Payroll software provides a powerful data entry and analysis tool for all labour costs, full integration with the latest Sage Payroll and Trimble Contract and Job Costing modules. Payroll Costing is available in different versions to suit all sizes of business. See which version best suits your needs. Perfect for medium sized contracters who need an easy to use package that will handle all your payroll needs. Designed for larger contracting companies and corporate users who wish to integrate a complete job management system. Process your weekly and monthly payrolls on the way that suits your business. 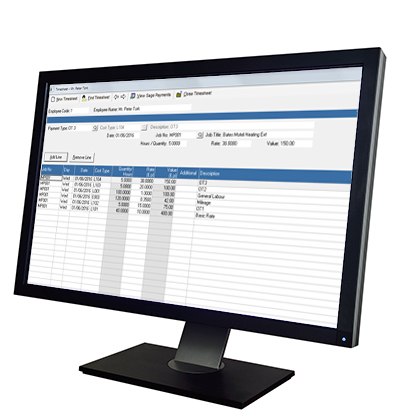 For more information about Payroll Costing, you can request a demo or view features.